The pathos of Beautiful Ruins meets the hilarity of Crazy Rich Asians in this comedic and tender novel. Their meeting in a parking lot outside a high school football game was both completely forgettable and utterly life-changing. Because no matter how you look at it, it is piss-poor luck to meet the love of your life before your life has even started. Fierce and ambitious, Alison is determined to shed her midwestern roots and emerge an actress. Kyle, all heart and spiritual yearning, believes medicine can heal the world. What could these mismatched souls have to do with each other? Everything and nothing. Even as their fates rocket them forward and apart, neither can fully let go of the past. When Alison gets her lucky break in New York City, she ends up on the fast track to stardom and a world far more different from Cincinnati than she could have ever imagined. Back home in Ohio, Kyle has a shotgun wedding and starts a pediatric practice in suburban hell. While Kyle's dreams begin to molder, Alison learns that the spotlight is always circled by shadows. As their lives inevitably intersect, Alison and Kyle must face each other in the revealing light of their decisions. 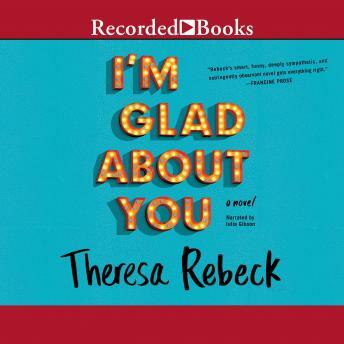 I'm Glad About You is a glittering study of how far the compromises two people make will take them from the lives they were meant to live.